One of the foremost factors in getting a good night’s sleep is having the right pillow. Height, softness and support are all extremely personal preferences, and having things off can result is a lesser quality of sleep. Here are the differences between memory foam and down pillows, in order to help you choose the right one for your needs. Memory foam is a initially firm but softens due to pressure and body heat, meaning it molds around the contours. In terms of pillows, this means it cradles the neck and head during sleep, feeling firm but offering a lot of support. Memory foam molds around the contours of the head or body and has a slow response time. 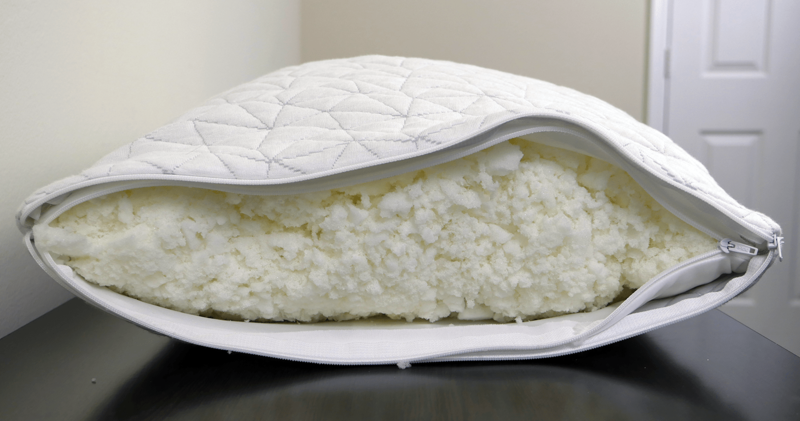 Read: Our favorite memory foam pillows HERE. It was developed to improve the safety of aircraft cushions, and the technology was soon adopted by hospitals, for use in wheelchairs or beds of immobile patients to reduce bedsores and help spinal support. It eventually made its way to the consumer market in mattresses and pillows. Down is a term for the back, wing and chest feather of a bird – typically a duck or goose. It refers to the “inner” feathers, rather than the firm and waterproof outer coating. Down is softer and much fluffier. It’s more expensive than just feather pillows, but generally offers superior comfort. Down can be collected from natural bird molting, but is typically plucked from birds bred for meat. Support. Memory foam offers a good amount of support. It holds the head and neck supportively and maintains its shape. This can make it great for those suffering from neck and back pain. Durability. Memory foam pillows last a very long time, and are very resilient – they literally “bounce back” – albeit slowly. Smoothness. Because memory foam is manmade, it’s a consistent substance without lumps. Even as it ages and wears, memory foam remains very smooth in consistency. Snoring. For those who snore when on their backs, memory foam can help. It better supports the neck and opens the throat in comparison to down pillows, helping air travel easier through the esophagus and reducing night time noise. Comfort Lasts All Night. As a result of their firmness, a memory foam pillow doesn’t compress as flat as a down pillow even over a longer period of time. So there’s less need for rearranging or pillow flipping. This can contribute to a better night’s sleep with fewer interruptions. Heat. Memory foam is not a particularly breathable material, meaning it can retain heat and feel uncomfortable. This is particularly a problem for those who struggle with a high body temperature, or those in hotter climates. Heaviness. Because of its initial firmness and compact construction, memory foam pillows tend to be much heavier than their down counterparts. They can feel cumbersome, and be difficult to maneuver and store. Initial Scent. Many people report a new memory foam pillow to have an unpleasant, chemical scent. Although this does tend to fade over time, it can be particularly bothersome in a pillow, which is close to the nose for several hours at a time. Price. Memory foam pillows can often come in at a higher cost than a down alternative. Sleeping Position. Memory foam is generally seen as better for back sleepers, as it offers the best back and neck support that way. The support may be too rigid for side and front sleepers, and front sleepers struggle to breathe through them. Softness. Down pillows are extremely soft. They contour immediately around the shade of the neck and head, so rolling around on one is very easy. They usually feel very forgiving and pleasant. Warmth. Down retains some warmth, while still remaining breathable. This means that although the head will be kept at a pleasant temperature, you’re unlikely to feel sweaty or clammy during the night. Durability. Down pillows are also very long lasting. If cared for correctly, they can last ten or fifteen years. Price. When compared to memory foam pillows, down generally has the advantage in terms of a lower price. Allergens. Because they’re made of a natural fiber, it’s much more difficult to ensure down pillows are completely hypoallergenic. And for those with sensitivity of allergies to waterfowl, they’re generally ill-advised. Spikiness. Although the spikes of down feathers aren’t as sharp or rigid as those in outer feathers, they can still poke through the ticking of a pillow and scratch or poke. Lack Of Support. Over the course of the night, a down pillow continues to sink around the contours of the head. This can cause it to get too compressed and too flat, causing discomfort and even sometimes contributing to neck pain. Potential Lumpiness. After a long time of use, oils and moisture from the body may interfere with the down inside a pillow, causing it to clump together and interfering with its smooth consistency. Need Constant Fluffing. Down pillows require a “fluffing up” after each use, both to look appealing and to replenish with air, to help retain the feeling of softness. Animal Cruelty. There are concerns about the collection or plucking of down feathers in terms of ethics. Down is an animal byproduct, and thus its use for human comfort is a tricky moral issue. When making a decision on which pillow to buy, it’s important to focus not just on other people’s reviews but your own lifestyle and preferences. If you snore or have a partner that does, for example, memory foam may be a brilliant choice and save your sleep. If you prefer soft pillows, or your tend to run cold, a down pillow could massively improve your sleep experience. Taking your own lifestyle into consideration is key to make the best pillow decision for you. Check out our full guide to buying the right pillow for your needs. Although there are guidelines that can help you choose the right pillow for your needs, it ultimately comes down to personal preference. Both down and memory foam pillows have a very distinctive feel, and depending on what you enjoy and find most comfortable either can be a great choice for a good night’s sleep. If you want help in getting the very best of your chosen category, though, check out our best pillow guide here.